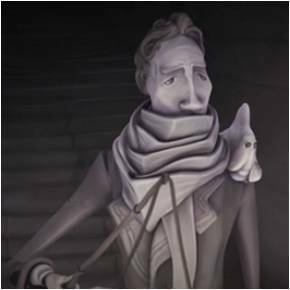 This amazing animated short film, The Tale of Mr Rêvus is the graduation (Diploma) film of Marius Herzog, produced at the Georg-Simon-Ohm Hochschule – University Of Applied Sciences, in Nuremberg, Germany. The challenge of this movie for Marius was to reproduce the entire production process of an animated 3D short film on his own. This included story development, concept design, modelling, rigging, directing, editing, animating, rendering and finally compositing. The superb score was orchestrated by Simon Scharf, a student at the Hochschule für Musik also in Nuremberg (HfM), conducted by Guido Johannes Rumstadt and played by the orchestra of the HfM.